(11.10.11) Born December 16, 2004 blue and not breathing, it is a miracle that Dylan is even alive. 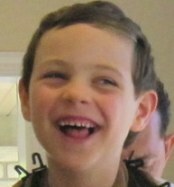 A happy and loving 6 year old boy now, Dylan has come along way. It hasn't always been easy but Dylan fights every day as he strives to reach the independence with dressing, walking, seeing and talking. It wasn't until Dylan was 5 months old that his parents, Jinger and Mark, learned the extent of their sons brain damage. He was diagnosed with Optic Nerve Hypoplasia which has left him legally blind. He also has diabetes insipidus (sodium diabetes), hypothyroidism, growth hormone deficiency, and cortisol/adrenal insufficiency (his body doesn't produce enough adrenalin in response to sickness, danger or injury). Any sickness or injury puts his life in jeopardy. As if that were not enough, Dylan began to miss his milestones as he grew. He did not rollover, walk, talk or even crawl. It was at 1 ? years old that he was then diagnosed with Cerebral Palsy. The family immediately began to seek more specific medical treatment for their son. They flew to Philadelphia, PA to a facility specializing in children with brain injury. There, the family worked with doctors to develop a home program that would be conducted 3 to 6 hours each day and help Dylan to get better. In 2009, Dylan was accepted into a study at Duke University that would allow him to have a stem cell reinfusion, reintroducing stem cells taken from his umbilical cord aand banked at birth. Almost immediately, Dylan began to make improvements. It was about 100 days later that the family came to Bend to begin Hyperbaric Oxygen Therapy. BMC was the only chamber in Oregon that would treat Dylan. After only 24 visits, they started seeing changes in Dylan's sight and ability to communicate. Dylan continues to improve each day. He spends a lot of his time in different forms of therapy working to make his sight, mobility and speech better. He loves to spend time with his mom and dad who spend countless hours working to help Dylan improve his daily life and have a brighter future. Some of his favorite things are riding horses, being taken on walks by the river, and practicing walking with his walker in the halls at the Bend Senior Center and visiting with his friends there. Sparrow Cash raised for Dylan will go to help the family continue Hyperbaric Oxygen Therapy which has helped make the most significant changes in Dylan's life. It will also go towards the many other types of therapy he receives weekly as well as living expenses and medical costs.